This document describes the different mechanisms and config file options that are available for Xen. From a user's perspective the HVM Boot and install process is identical to the process on a native PC or server. The hvmloader is copied into guest memory by Xen (under the control of the Toolstack). The hvmloader sets up all necessary information for the Device Emulator which emulates a HW environment that appears exactly like a physical machine. The correct firmware is automatically loaded as a binary blob (usually located in /usr/lib64/xen/boot) and copied into guest memory based on config settings, but can be overridden via the firmware config file option. See the various firmware options in the man page. When installing a new guest OS it is often useful to boot directly from a kernel and initrd stored in the host OS' file system, allowing command line arguments to be passed directly to the installer. This capability is usually available for PV, PVH and HVM guests. In this case, the bootloader and firmware are bypassed. Direct Kernel Boot is often an easy way to start the installation process and create a disk image. To install VMs this way, you need to be a host administrator (aka you need to have access to Dom0). Direct Kernel Boot is also useful for netboot. Note that most distros have kernel and initrd file systems available for download. In some cases, you will need to download an ISO, mount it and use the kernel and initrd from the ISO. Note that PVGrub is a more secure and more efficient alternative to PyGrub to boot domU images. 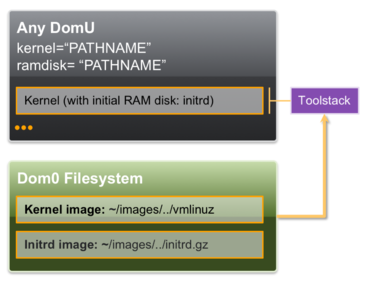 Unlike Pygrub it runs an adapted version of the grub boot loader inside the created domain itself, and uses the regular domU facilities to read the disk mounted as root directory, fetch files from network, etc. It also eventually loads the PV kernel and chain-boots it. PVGrub allows host admins to configure what guests and kernel versions a guest admin can install: this is also one of the main drawbacks. It can also be used for PXE booting. Xen does not come with PVGrub: you will need to install an appropriate distro package (make sure that Xen support is enabled) or build it from source. An example of this workflow can be found here. PVH guests are intended to be guests that do not require device emulation. Integrated boot support is not yet implemented, this Direct Kernel Boot has to be used. In future, Xen will boot through a minimal EFI environment for guests, which will ensure that the boot process for Xen PVH guests behaves like a standard boot process. This page was last modified on 13 September 2018, at 16:13.